Grand Cinemas Kuwait uses the force and rolls out the red carpet for Star Wars Legend! The force was with Grand Cinemas as the region’s fastest-growing cinema chain welcomed a Hollywood A-Lister on the red carpet for the very first time In Kuwait!Anthony Daniels, famous for playing the Droid C-P30 in the ‘Star Wars’ franchise, was the lead guest at a star-studded buffet Lunch and screening at Grand Cinemas Al Hamra Luxury Center this Saturday. English actor Daniels was joined by actor and director Johnny Cruz, who starred in 2011 movie ‘Small Timers’ and 2014 TV series ‘Matador’, alongside the Japanese actor and producer Gaku Space, known for his roles in ‘Street Fighter: Assassin’s Fist’ and ‘Overwatch’ (2016), and addition to a handful of International Comic celebrities, nation's Public Figures and VIPs for the history-writing event at Grand Class Lounge. The trio walked down the red carpet at the cinema, where they posed for photographs and interacted with fans before heading inside the theater for lunch with a host of distinguished members of the media. Daniels, who also starred in TV spin-offs of the iconic Star Wars movies, was honored by' HYK Events'. As a cherry on top, the event was sealed with an MX4D screening of the latest Comic blockbuster 'Logan'. 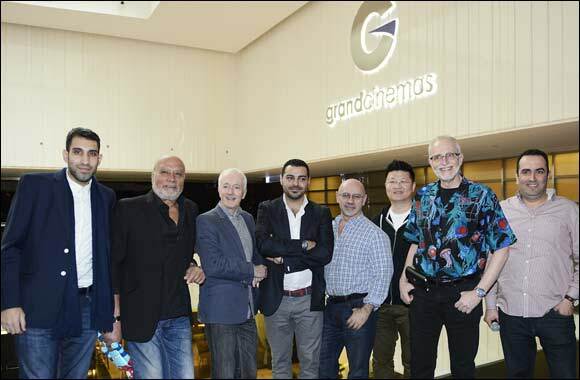 Isaac Fahed, of Grand Cinemas, said: “ Grand Cinemas has always been home of the stars and Celebrities, and now we're thrilled and honored to have a Hollywood Icon such as Anthony Daniels in our theater . This is a FIRST in Kuwait, and certainly not the last. Events like these are what make us stay true to our mission and Slogan 'Always Entertaining', Fahed said. Earlier in the day, Daniels, Space and Cruz attended the Comic Con event, a yearly celebration of popular culture and Cosplay in Kuwait.